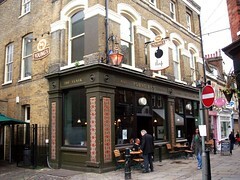 A Young's pub just behind Hampstead Station, refurbished in 2007. The place clearly has some history, and still retains separate public and saloon bar entrances, though the bar, in the middle of the building, serves both spaces. The saloon bar has two long tables by the front windows, and a couple of other smaller ones in the middle of the room, as well as more down behind the bar in a far darker area. There's a brighter (bookable) room to the rear of the building, with its own separate (smaller) bar. There are also tables outside on Flask Walk. Staff are friendly, and on Ewan's visit, take clear effort in making his Pimm's (they find celery, pear, and apple to go in it). Ales on handpump are Young's ordinary, Young's Special, Waggledance, Courage Directors and Bombardier. They also have Addlestones cider, and the usual lagers. Food is served noon-3pm and 6pm-9pm Monday to Saturday, and noon-5pm Sunday. Last visited by Ewan and Kerry, 25 June 2011. Opening hours and food times taken from Young's website, June 2008. Last edited 2013-05-10 07:10:27 (version 8; diff). List all versions. Page last edited 2013-05-10 07:10:27 (version 8).